ETSU Hoops has just learned tonight that Aaron Augustin a 5-11 PG from Suwanee, GA has committed to ETSU, making him the first early commitment for the 2016-2017 season. Aaron Augustin averaged 16.6 PPG, 4.3 APG, and 2.3 steals for Peachtree Ridge High School this past season. 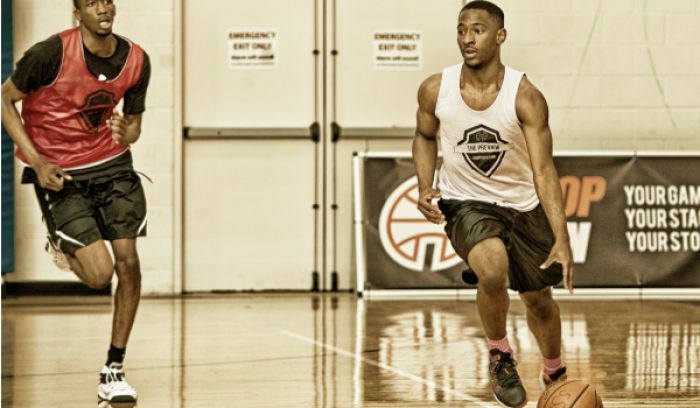 Augustin is currently ranked eighteenth on the HoopSeen 2016 Georgia rankings, and some consider him the best PG in Georgia. ESPN rated Augustin as a 3 star recruit and 35th best PG in the country from the 2016 class. Aaron fills an essential need for ETSU since both Petey McClain and Ge’Lawn Guyn (ETSU’s only PG’s) will graduate this coming season. Aaron Augustin talked with Hoopseen about his decision to go to ETSU. “I just believe in Coach Forbes’ vision for the program. They have some big time players there this year and most of them will be returning,” Augustin told HoopSeen. In addition to ETSU Augustin also had offers from Middle Tennessee, Mercer, Georgia State, Georgia Southern, Furman, Towson, Chattanooga High Point and Tennessee Tech. 2016 PG Aaron Augustin just verbally committed to Steve Forbes & East Tennesseee State, a source tells Scout.